I am having crowns replaced over tooth number 4 & 5. There is, as I believe, no cosmetic value of using pure porcelain versus Crown Porcelain fused to High Noble. There is a significant extra cost of $200.00 per each pure porcelain. In general, would a pure porcelain fused to a High Noble versus pure porcelain be just as effective over the long term? First, I like to talk about terminology so we know exactly what we are talking about. We should be saying all-ceramic crowns, not all-porcelain. Porcelain is only one of various ceramics that have been used for crowns and even some dentists gloss over this terminology. Few dentists are placing all-porcelain crowns on back teeth these days because they are very technique sensitive and are much weaker than the newer high-strength ceramics, lithium disilicate and zirconia. The eMax crown, which I believe is the most popular crown being used by dentists today, features a lithium disilicate core with porcelain baked over it. Lithium disilicate has reasonable aesthetics—it is white and somewhat translucent—but it comes in blocks and is shaped by milling, so the technician doesn’t have the ability to manipulate the color the way porcelain color is manipulated. Porcelain comes in a paste and it is placed, shaped, and then baked. So the ceramist can apply various colors and translucencies of the paste in different layers over the lithium disilicate core with a great deal of control over the aesthetics. My guess would be that your dentist is talking about putting all-ceramic crowns on your teeth numbers 4 and 5, which are the first and second premolars on your upper right. So your question is, should you get porcelain fused to high noble (otherwise called porcelain fused to gold) instead. Cosmetic dentists consider upper first premolars to be in the smile zone on almost all patients. Practically everyone will show that first premolar prominently when they smile. It may not be prominent when you look at yourself straight on in the mirror, but it is very noticeable from the side. For me, I would not want a crown made of porcelain fused to gold or any other metal here because there will be a significant risk of a dark line showing at the gumline. The dark line comes from the metal foundation showing through right at the margin of the crown. Behind that first premolar, in my smile, the teeth are all in the shadows, so the aesthetics is much less critical there. In my mouth, I do have a porcelain fused to gold crown on one of those teeth. I also have a crown on my upper left first premolar, and that crown is an eMax. So my answer is that I disagree that there is no cosmetic value here. Having said that, if you were my patient and wanted the porcelain fused to gold crown on your first premolar, I wouldn’t fight you on that. But then I probably wouldn’t have the issue come up because I would charge the same fee for either crown. A porcelain fused to high noble crown is a premium crown, and I charged more for that than for a porcelain fused to noble (semi-precious metal) crown. But I don’t understand why the all-ceramic crown needs to be more than the porcelain fused to high noble. I reside in Henderson, NV. I have four porcelain fused to metal crowns on my front teeth since I was 24 yrs old. In 2015, I wanted to update dental work, I ‘Kör whitened‘ my teeth, which made those crowns look bad. I visited a cosmetic dentist, Dr. Featherstone who you have listed on your website. At that time, my paltry insurance would not co-operate, so I didn’t stay with Featherstone. His billing assistant actually had a credit application there to apply for a loan. Plus, she said, we had to pay in advance, and if there were money left over at the end, they’d refund it. My husband & I slunk out of there, glad to be free of that. Next, I visited Dr. Michael Wilson, the only other one on your Nevada list. He would not do four, only eight, saying about four, “You won’t like it.” At first I agreed to do it, right then and there, he measured for a laboratory wax-up version, $800. I backed out the next morning, and a week later went and picked up the model. He was decent about it, and we left the door open. Well, from there, I went to my general dentist, Dr. F. Those original crowns from when I was young were big and long and gave me a big smile, in every picture all my life. Now, Dr. F’s version are short, greenish (I picked the wrong shade). His words were, “I’ll make sure you get the teeth that you want.” But, he couldn’t please me, and ended up giving it to his assistant. I mean, it was excruciating, going over it again and again. You finally just settle. These teeth are too short, when I wake up in the morning with mouth agape, you can’t even see any teeth (thus, it makes you look like an old person). She remarked, “Oh, you probably are looking on the internet, and expect these perfect teeth.” Yes, exactly. I had your examples and pictures in hand. Anyway, here I am, three years later, still not sure where to turn. Thank you for letting me vent. I live with this. My husband raises his voice at just the very mention of it. Quite the story you have. I’m confident that either Dr. Featherstone or Dr. Wilson would have done a beautiful job for you. I’ve seen work from both of them and have interviewed them both. It’s too bad that they were too expensive for you. Your case illustrates a point I often make—if you can’t afford quality cosmetic dentistry, it’s better to do nothing and save up to have it done right than to go cheap. If the first dentist who did the Kör bleaching knew what he was doing and was honest with you, he would have told you that the crowns wouldn’t bleach and the results would commit you to re-doing the crowns. It would have been good to have had a complete plan from an expert cosmetic dentist from the start. About Dr. Wilson wanting to do 8 crowns instead of 4—we see this where good cosmetic dentists will disagree on how to proceed with a case and in some cases will turn down a case unless they can do it the way they think will turn out the best. When I was practicing, I was more like Dr. Featherstone where I might compromise on a case because a patient didn’t want to spend more to get the “perfect” result. I have a space between my 2 front teeth, however one of my front teeth is a crown and the other front tooth is part of a bridge. Can the gap between my front teeth be closed with Lumineers or any other procedure or would I have to get a new bridge and crown, possibly all in one structure to close the gap? Your question prompts me to ask a question of my own: Why did the dentist who made the crown and/or the bridge leave a gap between your front teeth? The easy way to fix this would have been to make them correctly in the first place. At this point, yes, you pretty much need to have probably both of them re-made—depending on how big the gap is. Both front teeth need to be the same size—you don’t want to close the gap from just one side by making one side larger. But there is a procedure you might want to try before doing that. 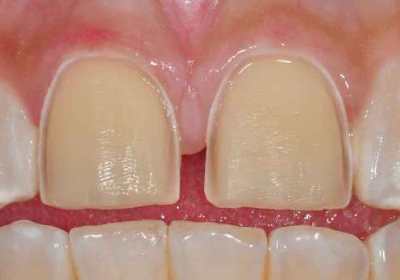 There are ways to bond composite to porcelain, and you could start with trying that—treating this as a dental bonding case. If the dentist has what is called a micro-etcher, which is a small sand-blasting handpiece, he or she could micro-etch the porcelain surfaces next to the gap. This would be followed by etching with a hydrofluoric acid gel and then priming the surface with a silane coupling agent. A bonding resin would then be applied followed by composite bonding material to match the shade of the crown and the bridge. The composite would be shaped and polished. In theory, this should work. However, my experience with bonding to porcelain was that after a few months, we would see staining along the margin between the composite and the porcelain. But it could be worth a try to try to avoid the expense of a complete re-do of your front teeth. I would think it goes without saying that you need an expert cosmetic dentist to do this, such as we recommend on this website. The company that makes Lumineers, a few years ago, tried to promote the idea of bonding Lumineers over the top of porcelain crowns, but I strongly discourage that. You would get the same risk of staining at the margins, and would spend the same amount of money as you would spend just re-doing the case completely. Click the link to read more about the problems with that approach. I had a root canal done on my front tooth over 10 years ago. In the past few years I had noticed a blue discoloration at the top of the tooth. After trying internal bleaching, my dentist ended up doing a crown. The first crown that came back from the lab looked very white. He redid it. The next tooth, which is in my mouth now, looks better but doesn’t match the other front tooth. The dentist permanently cemented it in, but when I got home and took some selfies I was unhappy with how unnaturally white it looks. The dentist will give it another try but my question is — should I let him try again or go to someone else who specializes in cosmetic dentistry? I now live in Princeton, NJ and my dentist is in Brooklyn. Cost is a factor. Doing a crown on a single front tooth is a tricky procedure. The slightest variation in color between the two front teeth is usually very noticeable. And it isn’t just the overall color—any tooth has multiple colors in it. Even expert cosmetic dentists will often have multiple try-ins before they get the crown to match perfectly. When I was in practice, I charged about 40% more for crowning a single front tooth because we would typically send it back to the lab three or four times until we got it perfect and I would charge the extra fee because of all the extra appointments. Dentists with poor cosmetic dentistry skills sometimes ask patients to crown both front teeth in order to get the color right. That your dentist would think that the crown would look right after one or two trips to the lab shows either inexperience or a low level of commitment to excellent cosmetic dentistry. I’m not meaning to imply condemnation with that comment because that is typical of the overwhelming majority of dentists—maybe 98% of them. So yes, if you want this done so that your two front teeth match perfectly, you need to raise your sights and go to an excellent cosmetic dentist such as we recommend. There are several excellent ones within reasonable driving distance of Princeton, say 15-30 miles. However, depending on how big a factor cost is for you, and if your dentist is willing to work with you to get this right for no extra charge, you may want to stick with this dentist to save the money of having another dentist start over with you. And, I would add, if you are willing to make several more trips back to Brooklyn. To help the process, you or the dentist should get hold of a good digital camera that is capable of taking a clear photograph of the new crown in place next to your natural tooth under outside light, such as right next to a window. That will go a long way toward helping the ceramist pin down the right color. And be sure that the crown is only temporarily cemented until you have seen it under various lighting conditions. If you want perfection—a crown so natural that you can’t distinguish it from the real tooth next to it—you need the expert cosmetic dentist. But if you are willing to accept some compromise of that ideal in order to save money—try letting your dentist have some more tries to get this closer. Due to a recent fall, I broke my 2 front teeth as well as the one to the left of my front teeth. I had 3 root canals and 3 porcelain crowns placed. I’ve had 2 attempts as the first permanent set were off in color, too big and thick. The 2nd permanent set matched in color and were closer in size and thickness to my natural shape. After they were permanently cemented they all had a grey hue close to the gumline on the tooth. The dentist has reluctantly agreed to redo my crowns stating he would try to make sure the core is as white as possible. I’m not sure what to think or if he can even fix the issue because he did say he couldn’t promise this issue would be resolved? What are your suggestions? Thank you! Your problem is simply that your dentist doesn’t know enough about cosmetic dentistry. One of the issues that family dentists have the most trouble with is color, so the problem he is having is not unusual. If you have two or more crowns on your front teeth, this is a pretty simple color task for an expert cosmetic dentist. The fact that these crowns were too big and thick and the color was off on the first try makes me worry about the level of skill here. On the second try, having them be too gray at the gumline is not a great confidence builder, either. This isn’t a difficult situation. My advice would be to be fussy. It is possible to get the color and shape exactly right and in the right hands, no one should be able to tell that these are crowns on your front teeth and not your real teeth. Don’t settle for anything less than that. You’re not giving me any clinical details about the types of crowns we’re dealing with, and there are several possibilities for getting this grayness that you’re seeing. Let me make an assumption of what I think is the most probable scenario. My best guess is that your dentist is using pure ceramic crowns of one type or another with a metal post and core to reinforce the inside of the tooth, and the gray color of the metal is showing through the translucent ceramic. There are several ways to deal with this. If I were doing your case, I would have used a fiberglass post and a composite core that was close to the color of your natural teeth. That’s the easiest way to get a natural translucency to the crowns. If we’re stuck with the metal core, then what I would have done would have been to bond an opaque layer on top of the metal to block out the metallic color and then bond the crown on top of that opaque layer. Another option would be to give clear instructions to the laboratory technician about the color and extent of the metal core, and let the technician incorporate opaquing into the crown. The problem with many family dentists is that they don’t understand translucency and the impact of interior colors on the external appearance of the tooth. Your case bothers me, though. You’ve had this accident, and you would think that you should be able to go to your family dentist and he would know enough to fix this. Or, if he didn’t, that he would know enough to refer you to someone with more expertise in cosmetic dentistry. But that is the state of cosmetic dentistry in America. Dental academia trivializes cosmetic concerns and the powers that be in the profession are adamant that cosmetic dentistry isn’t a legitimate specialty. If there were a higher level of respect in the profession for aesthetic skills, there would be more inclination to either refer these cases to a specialist, or maybe to train general dentists better in these color skills and you wouldn’t have situations like yours. Your case doesn’t require a high level of aesthetic skills—only a moderate level. The fact that your dentist has missed this twice and now is unsure that he can fix the color shows a fundamental lack of understanding of basic color management. Should I get a radiolucent crown or a radiopaque crown? I came across your blog and read your very interesting response to a writer with root canal issues. I, too, seek your advice. I had my lateral and central incisor teeth filed down for a bridge (missing the two teeth in-between). I changed my mind from having the bridge when I learned about some negatives surrounding it, and went back to the partial denture. I have been wearing the temporary crowns for almost 6 months now. I ended up having to do a root canal on the central incisor and I have been told that the lateral will also need a root canal because it has been exposed for too long and I am getting sensitivity to cold. I am not keen on doing another root canal. I read about pulp cap in your blog. That’s interesting. Does this need a special dentist to perform? Could you also tell me which dental crown is radiolucent? I was interested in the eMax crowns (lithium disilicate) but I read that it is radiopaque and as such will block xrays and disallow evaluation of the tooth underneath over time. Could you please tell me if this is so? And if this is so, could you tell me which is the best material for my now vulnerable teeth. I have a lot of anxiety that I might lose them. I hope that you aren’t trying to micro-manage your dentist and make all these clinical decisions for him or her. One thing I worry about in providing all this dental advice is that patients, thinking now that they are armed with sufficient knowledge, will try to tell the dentist what materials to use or will obsess over these decisions. I hope you’re not doing that. When you tell me that you have been wearing temporary crowns for 6 months and have all this anxiety I want to tell you to let go and let your dentist make these decisions. Do the best you can with the knowledge that I provide here to find a dentist you can trust and then trust him or her. It sounds like you’ve been stewing over these decisions, wearing these temporary crowns for so long, and now one of the teeth became hypersensitive and needed a root canal and another is getting that way. It surely is time to let your dentist finish your case. You’ve latched onto this question about whether a particular crown material is radiolucent or radiopaque and have decided that you want a radiolucent crown. But you don’t know enough to be getting into the weeds this deeply. There are a number of factors that go into selecting a material for a crown, and you have a very imperfect understanding of even this one factor. But since you asked, let me explain a little about this issue. The only type of crown that is radiolucent is a plastic crown, which would be used as a temporary crown. A radiolucent crown is one that doesn’t block the x-rays at all. So yes, you are right, that with the x-rays you can see right through it. The problem is that decay is also radiolucent. Decay would tend to start at the margin of the crown, and with a radiolucent crown it would be impossible to tell for sure what is decay and what is just part of the crown. But, you say, a radiopaque crown blocks the x-rays and so you couldn’t see under it. Here’s where oversimplification is getting you into trouble. There are many degrees of radiopacity. The ideal would be to have a crown that is partly radiopaque, just like tooth structure is. It doesn’t block the x-rays completely, only partially, so you can see through it to a certain extent but it doesn’t look just like decay. 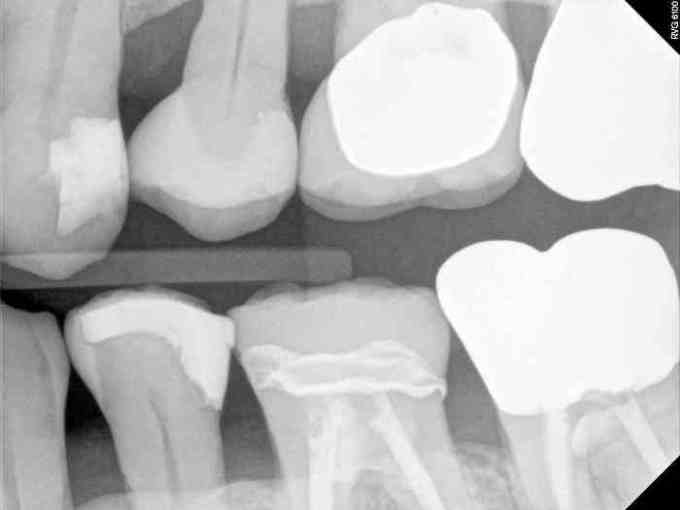 To illustrate, here is an x-ray of a patient showing four types of crowns plus composite filling materials, and you can see the variations in radiopacity. None of the restorative materials used are radiolucent, for the reason I gave above—radiolucency causes the most complications for diagnosis. On the upper, starting with the canine on the left, we have a composite filling that is partly radiopaque. Next, on the premolar, is an eMax crown. Yes, it is radiopaque, but it has a very helpful partial level of radiopacity that makes it easy to tell what is going on with the tooth. Next, on the first molar, is a porcelain fused to metal crown. True, you can’t see through it, but you can see what is happening on the margins, which is where you would expect recurrent decay to start. Finally, on the second molar, is a gold crown. On the lower, the premolar has a composite filling, the first molar has a CEREC crown which is made of lithium disilicate, and the second molar has a gold crown. My preference for crowns on second molars is gold, even though it is totally radiopaque. I have heard many dental educators and researchers state the same preference. I’m not going to go into all the reasons here for that choice. I only want to make the point that this radiopacity is not a simple cut-and-dried issue nor is it the only factor to be used in the choice of a crown material. My question: Can adhesive-bonded e.max crowns be safely removed without breaking the natural tooth which is already fragile? History: I recently had the front six teeth re-crowned with e.max. The four front teeth have now been crowned for the 5th time (all by different dentists). I was happy with the first crowns I had, but after 15 years they needed to be replaced. I have yet to find a dentist who can replicate the smile I had before. I’m now stuck with e.max crowns that are thick and bulky with dark showing around the gum over my central incisor. My dentist said he would replace them but I know with each manipulation, I am risking the possibility of losing a tooth (or teeth). My dentist said he made the e.max crowns thicker because my gums were thick (the gums have buttressed from years of clenching). He has now asked I have crown-lengthening and have some if the bone removed before replacing crowns. I am so afraid of losing my teeth and having to have dental implants but I so want my old smile back. If I’m getting this straight, your dentist gave you thick crowns because your gums are thick. If that is his true reasoning, I wouldn’t let him re-do your case. There is a gross misunderstanding of esthetic and functional principles here. 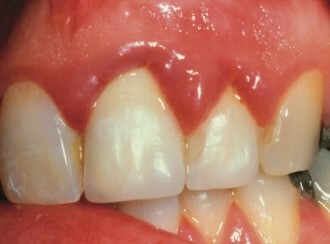 Thick crowns will cause the gums to become inflamed and puffy, so this has the potential to be a functional disaster. Plus there is no aesthetic reason for your crowns to be made thick in this situation. The dentist should make sure there are natural contours to the teeth as they come out of the gum. I found this photograph showing what happens when crowns are too thick. It creates a protected space where the crown meets the tooth and in that protected space, gum-disease causing bacteria multiply freely. Microscopic food particles will get trapped there, it is impossible to clean effectively, with resulting gum disease and puffy gums. After almost 40 years of experience in dentistry, I must say I have never heard this aesthetic principle taught or even mentioned, that thick gums mean you need to do thick crowns. Rather, what I have heard is that you always need to have a natural emergence angle where the crown meets the tooth. You should not be able to feel any bulges as you run an explorer up from the root of the tooth onto the crown – the contour should be straight and smooth. Now, as to your actual question about removing e.max crowns. 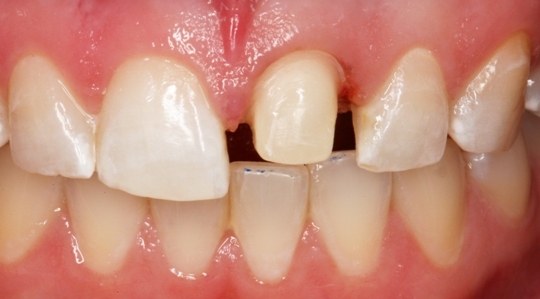 These crowns are made of a very tough material – lithium disilicate – which makes them difficult to remove. And you say they were bonded on. The only way to get these off is to grind them off. Your dentist will need a supply of diamond burs to methodically grind these off your teeth. If the dentist is good and knows what he or she is doing, there should be no damage to your existing teeth. That isn’t a problem. But I wouldn’t trust your current dentist to do that very carefully. His idea about thick crowns doesn’t show much care for precision in knowledge, which would make me worry about his being clinically careful. I would go to one of the dentists on our recommended list–I’m confident any one of them would do a great job for you here in carefully removing the existing crowns and replacing them with a beautiful smile. Besides the functional mistake in your new smile, there was a serious aesthetic mistake, and I want to say something about that, too. No good cosmetic dentist would have ever bonded these crowns onto your teeth without a test-drive first, either duplicating the new smile in plastic so you could wear that as a temporary smile makeover, or temporarily cementing the new crowns, so he and you could make sure that you love this new smile before it was bonded permanently. Should my dentist grind on my porcelain crowns? Earlier this year I got porcelain crowns on my 2 front teeth. One came loose and fell off. I had it “cemented” back on at the dentist & she ground down the porcelain to correct the bite after it was placed. Less than a week later the back side of my crown broke off where the bite adjustment had been made. What do you suggest? Should porcelain crowns ever be ground on or does this weaken them? When you get a new porcelain crown, it isn’t uncommon for the dentist to have to adjust the crown to your bite, which is done by grinding on it some. • First of all, one of the crowns came loose. This isn’t something that should be happening to a permanently cemented crown. Something wasn’t done right for a new crown to be falling off that soon. • Second, the bite should have been adjusted when the crown was first placed. This is strange that the bite has to be adjusted after it is recemented. Something went wrong in the recementation process. The recemented crown must not have gotten back on straight for it to require new adjustments. • And third, of course, you had the back of the crown break off. This wouldn’t happen unless the porcelain was ground so much as to be dangerously thin. The fix is to have this crown replaced. But I would go somewhere else for this. I have real concerns about your current dentist being able to get this right. Oh, and she should compensate you for having to do this. Would I let a rough hygienist clean my teeth? All of my top teeth (except the molars) have porcelain crowns. I was advised years ago not to have a Cavitron used to clean the crowns. I recently had my teeth cleaned by a new hygienist who became very upset when I asked her not to use the machine. She scaled my crowns with so much force that it was painful and I really worried she would break them. The 4 center teeth do not have a metal lining behind the porcelain and I treat them very carefully. Which is the lesser of two evils – the Cavitron or a brutal hygienist scaling my porcelain crowns with hand instruments? Could there really be that much plaque on a porcelain surface? I’m getting a lot of these Cavitron questions lately. I think that’s because their use is getting more popular with dental hygienists. The Cavitron by itself won’t hurt your porcelain crowns or other porcelain restorations. See my earlier post on this: Is the Cavitron safe for use with porcelain veneers? We used to give a blanket prohibition against using the Cavitron with porcelain crowns or veneers, but our observation of the care being used by dental hygienists has caused us to soften that. Used properly, there is no risk of damage from the Cavitron to crowns or any other restorations. What bothers me most about what you told me is that your hygienist became upset when you asked her not to use the Cavitron. I talked to my own hygienist about this Cavitron issue and she said she gets a number of requests from patients to not use the Cavitron in certain places, or other requests, and she honors those requests. This haughty attitude and lack of sensitivity to the patient is not good. It’s kind of like you are in the way of her doing her job. She doesn’t seem to connect that you are paying for her services. Hygienists and dentists get a number of special requests like this from patients, and I believe the proper response is to honor those when possible. Yes, you may have made more work for her, but serving the patient is her job. To answer your question, yes, the hygienist can do damage even without the Cavitron. Heavy scaling can nick the margins. If I were in your position, I wouldn’t let this hygienist touch my teeth any more, whether she used a Cavitron or a hand scaler or a toothpick. If that meant switching dentists, I would do it, and let the dentist know the reason. From what you’ve told me, I have serious questions about how much she cares about her patients, which for me is the first requirement of quality care. In rough hands, a Cavitron can do significant damage not just to restorations but even sometimes to your teeth.